“Strange things are done ‘neath the midnight sun.” Had the author of that line, Robert Service, lived in Texas, he might have penned similar words about fishing the bays. Robert Sanchez and party could provide inspiration. Several years ago, the three waders entered the chilly waters of East Matagorda Bay for a wade. They were spread out 50 to 75-yards apart when a thick sea fog rolled in. “We didn’t think much about it. It gets foggy a lot in the winter,” Sanchez recalled. Nonchalance turned to worry when one of his friends disappeared. Sanchez hollered for the two to come his direction, but they were disoriented and could not find their way out. Within five minutes, Sanchez, too, was enclosed in a thick shroud of fog. Worse yet, they had no idea where the boat was. Fortunately, they all listened, but not all was well. On a couple of occasions, they heard boats coming within what sounded like dangerous range. The fog bank held for more than two hours and it seemed like days to the group. A more humorous – but still strange – saltwater fishing story comes from my dad, Chester Moore, Sr. He and a friend were fishing the Intracoastal Canal near the Louisiana border back in the late 1960s. The fishing was slow and the two were getting bored—until, that is, something strange and very large materialized next to them. After reporting the sighting to a game warden, they became a little embarrassed. Turned out the strange creature was a gentle manatee the warden had under observation. Manatees rarely appear in Texas. A correct assessment, for sure. My wife, Lisa, and I went snorkeling with manatees (a.k.a. 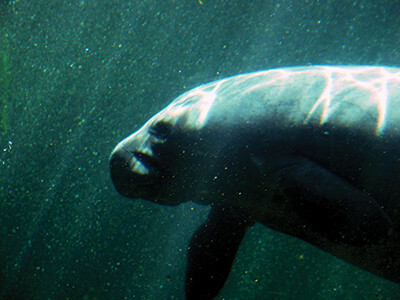 “sea cows”) in Florida’s Crystal River back in 1998 and found them gentle, playful creatures. Alligators are not such playful creatures. Unexpected encounters in the bay put quite an edge on a wade-fishing experience, but finding oneself besieged by a whole host of saurians is nightmare stuff even Stephen King would be hard put to dream up. In 1972, Bill Dearman of Houston was flounder gigging along a shoreline in East Galveston Bay. He had a bunch of flounder on the string and all was going well—or so he thought. “I had hopped overboard when I reached this one particular area and was going to wade about 50 yards of shoreline,” Dearman recalled. “I had just about decided to turn back when I heard something behind me. I looked back and there were two huge alligators following me. One of them had to be at least 10 feet long. “I decided to calmly walk to the shoreline, but noticed there was another gator between me and the bank. Then the thing submerged and so did one of the other two. I figured nothing from nothing leaves nothing, so I went ahead and walked toward shore without incident—until I started pulling in my stringer. One of the gators grabbed it. Callers to my radio show are a rich source of strange stories about the outdoors. One caller said his brother-in-law moved from New Jersey to Corpus Christi back in the late 1980s. His neighbor took him fishing down at Port Mansfield. 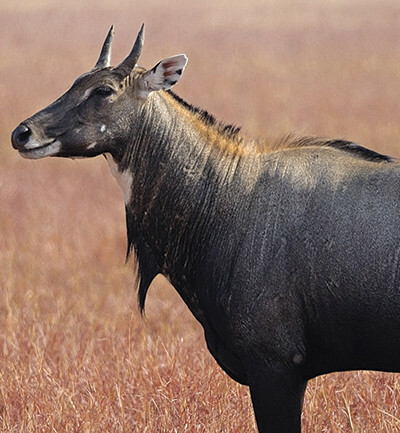 A Nilgai’s horns do have a certain “devilish” quality. Nature called and he waded ashore to tend to business. He was doing his duty when rustling in the dry grass caught his attention. He turned around to see a six-foot tall animal with a long neck and devilish-looking horns. The man ran from the brush down the shoreline toward his neighbor. By the time he got there, he was out of breath, had fallen down twice, and had left all his fishing tackle back with the Jersey Devil. When he calmed down enough to explain what he had seen, his neighbor quickly told him he had seen a nilgai antelope, a native of India imported and stocked on many Texas ranches. They are common in the Port Mansfield area and are harmless as whitetails. “He felt a little foolish, but still isn’t sure that wasn’t the Jersey Devil,” the caller concluded. Another caller said he was fishing in San Antonio Bay when he saw a feral hog enter the water on one side of a cut and start swimming to the other side. “This thing made it about halfway over when all hell broke loose,” the caller said. “Something pulled that thing under and the water turned red. The hog came up and then got pulled back down again. I wasn’t close enough to see what it was, but it had to be either an alligator or a big shark. Another caller said alligator gar routinely attack his stringer when he is wade-fishing Sabine Pass. Are Garfish more dangerous than sharks? “You look over and there’s a big garfish chewing on your stringer. It’s a pretty frightening sight,” he said. Half of the strangeness in these stories involves remoteness and isolation. Whether trapped in a fog bank or harassed by three hungry alligators at night, humans do not like to feel detached from the “safe” world of television, air conditioning, and home alarm systems. Most trips into Texas bays are routine, but sometimes strange things happen. And when they do, they shake up our sense of the “normal.” That’s always frightening—and later, a little bit of fun.